Back in 1929, Dr. J. R. Crewe MD of the Mayo Foundation, a forerunner of today’s Mayo Clinic, wrote an extensive article for Certified Milk Magazine about the curative effects of a raw milk fast. The only milk available in those days was, of course, raw milk rich in butterfat from old fashioned cows grazing on unsprayed pastures – nothing like the highly processed store milk of today full of synthetic fortification, allergenic proteins and antibiotic and hormone residues. The Milk Cure, as it was known, was an established, conventional therapy in the early part of the 20th century. Due to its simplicity, however, many doctors had little interest for the Milk Cure. Consequently, initiation of a raw milk fast typically came from patients themselves! The Milk Cure is also the subject of at least 2 books. 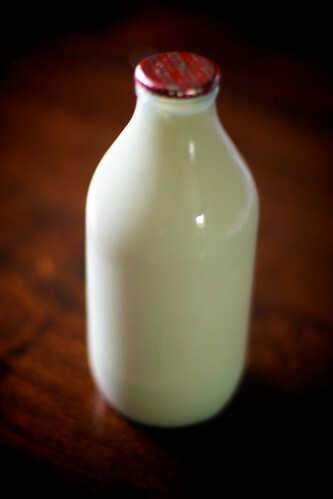 In Principles and Practices of Medicine, by Dr. William Osler MD, pastured raw milk is referred to as “white blood”. The reason is the close resemblance of milk to human blood and the stimulation milk consumption has on the body to make new and better blood. The patients are put at rest in bed and are given at half hour intervals small quantities of milk, totaling from five to ten quarts of milk a day. Most patients are started on three or four quarts of milk a day and this is usually increased by a pint a day. The treatment is used in many chronic conditions but chiefly in tuberculosis, diseases of the nervous system, cardiovascular and renal conditions, hypertension, and in patients who are underweight, run-down, etc. Patients with cardiac disease respond splendidly without medication. In patients who have been taking digitalis and other stimulants, the drugs are withdrawn. High blood pressure patients respond splendidly and the results in most instances are quite lasting. The treatment has been used successfully in obesity without other alimentation. One patient reduced from 325 pounds to 284 in two weeks, on four quarts of milk a day, while her blood pressure was reduced from 220 to 170. Some extremely satisfying results have been obtained in a few cases of diabetics. The Milk Cure has enjoyed a recent resurgence in popularity as people increasingly seek nontoxic, noninvasive alternatives to the drugs and surgery approach of conventional medicine today. My friend, Paula Jager CSCS, who writes the fitness posts for this blog, recently told me that she was going to try the Milk Cure herself. She initially planned to do a 5 day fast, but as of this writing she is on Day 9 and continuing with the fast until she feels the need to stop. Paula has been sending me daily updates on her progress with the fast and I asked her if she would mind if I posted them on The Healthy Home Economist in case others were interested in the process for themselves. She agreed, so I will be posting her progress and observations in the coming days for you, dear reader, to read and analyze! Day 1: The purpose of my raw milk fast is more of a cleansing or detox intent although I did take a starting weight of 123.4 on 3/15. Started off with 2 cups for breakfast at 7:30 am. Felt fine all morning, hungry at 10:30 am so had 1 cup. Was hungry at noon and was time for a workout. Energy was good though and did a light workout consisting of easy cardio and bodyweight exercises. Drank 3 cups for “lunch” around 2:00. 3 pm and feeling fine, pleasantly full, no hunger pangs, no real feeling of deprivation from not chewing. Drank every couple of hours and finished off the 3 quarts with about 2 ½ cups for dinner at 8:45 pm. Went to bed at around 10 and slept as usual. Day 2: woke up feeling a little hungry but not too bad. Was concerned about elimination but everything went smoothly this morning. Looked a little different, cream colored swirls in the usual brown color? TMI but thought I would include it. Rationed more appropriately today by consuming more for breakfast and early morning. Energy levels have been good all day and I am honestly not hungry and thus far do not miss chewing. I really do not feel any different at all today. I have been very busy with work, all good and it has been nice to not have to cook and take time to eat. So far, it seems really easy and I am not craving anything whatsoever. Sarah was right; the milk has a pale beige color to it. Seems extra creamy and delicious and 3 quarts seems to be a good amount for me so far. Day 3: not hungry at all this am, weight holding consistent. Slept very well last night but too soon to tell if related. TMI again but “waste material” was even more cream colored this morning, not sure what this means but went smoothly. Energy levels consistently good throughout the day and workout. Zero cravings or desire for additional food. It’s like my body is craving this. Days 4-6 to be posted tomorrow! Thank you, Paula, for sharing your journey with all of us!